A free shuttle bus for passengers links Bangkok’s two airports, Suvarnabhumi (airport code BKK) and Don Muang (airport code DMK). It can be a convenient option if you need to transit between the two, but if your flight connection times are tight you may still be best advised to take a taxi direct. I’ve used the shuttle bus service a few times now and found it to be reliable, but keep in mind it is a free service so it is going to have some limitations and won’t suit everybody. The shuttle bus departs from Bangkok Suvarnabhumi on the 2nd Floor (arrivals) outside Door 3. The shuttle bus service is clearly sign-posted from the arrivals hall. Outside Door 3 you will see a despatch desk where you should contact the staff. A sign by the desk says you need to show a boarding pass/proof of travel, but when I’ve used the service I only had flight details as a memo on my phone and was told ‘no problem’ and didn’t even need to show that. If you’re carrying luggage and are a genuine passenger transiting between the two airports you shouldn’t have any problems, but be prepared to show your flight details if requested. For passengers going from Don Muang to Suvarnabhumi airport, the shuttle bus departs from outside the passenger terminal at Don Muang and is clearly sign-posted. 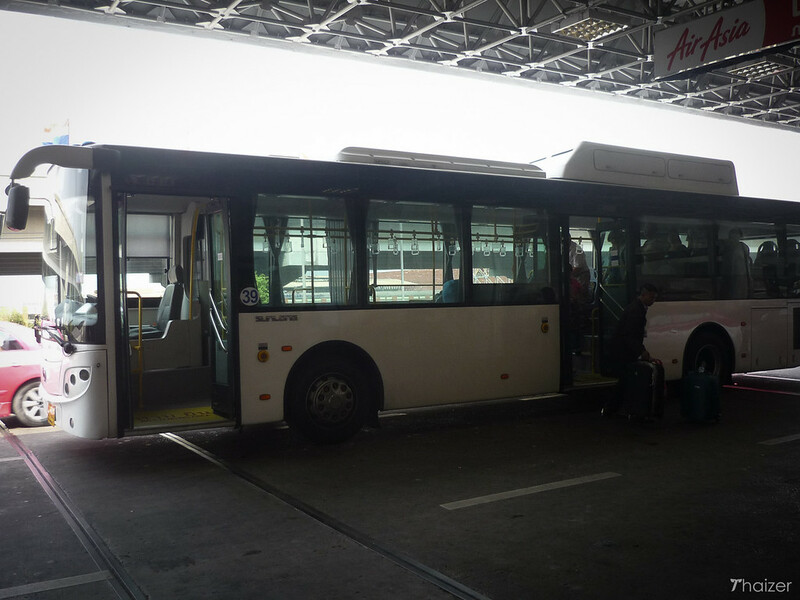 On arrival at Suvarnabhumi the bus drops passengers at the departure terminal on the 4th Floor by Gate 5. The shuttle bus service is operated by Airports of Thailand (AOT) and their target time for the journey between Bangkok Suvarnabhumi and Don Muang is 50 minutes. The times I’ve used the service have been off-peak and in good weather and the journey has always been punctual. If you are travelling during rush-hour and/or in heavy rain, then journey times may be longer. There are regular departures from 05.00-midnight in both directions. 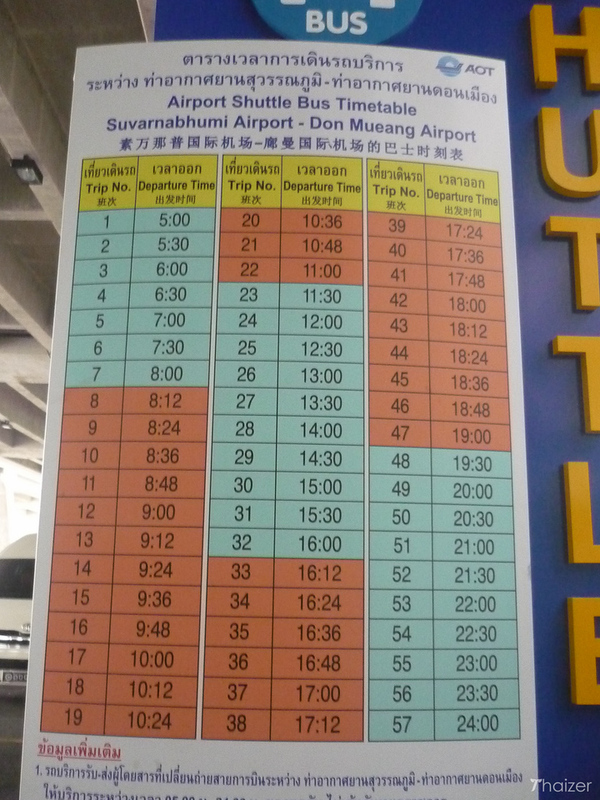 See image below which was taken at Bangkok Suvarnabhumi or the shuttle bus schedule here from AOT. The shuttle bus is a direct service between the two airports and won’t drop passengers off at any other points along the route. The buses are air-conditioned and there is a storage area inside for luggage. No alcohol or strong-smelling foods are allowed on board. Tickets can’t be pre-booked. The service is first come, first served on the day. You will be given a ticket by the dispatcher at the desk and if the bus is already full you have to wait for the next one. If for any reason you can’t get on the free shuttle bus, there is also a mini-bus service that runs from the Public Transportation Centre at Suvarnabhumi to Don Muang. I don’t have full details of departure times for those, but the cost is approximately 30 Baht. As mentioned previously, if you have limited times to make connections, pay the extra money for a taxi and ask them to take the expressway.